First off, my most sincere thanks for all the kind words and messages on my last post. It really meant a lot to me. I read every single comment and felt your love and care. Thank you. We have now entered the time of year where I want to eat and do all the holiday things. There is no shortage of activities and to-dos and I am on board for all of it. Really, sign me up. But I also don't want to be shackled to my kitchen while everyone else is off having fun. My latest trick has been making a big batch of soup and freezing half of it. I know, this is not new nor really a trick. I bet most people already do this but it's kind of like I just remembered it and man, am I glad I did. In the past month I made the following soups: chicken noodle, tomato carrot, spiced lentil, and split pea. With each batch I freeze a portion for future consumption and I when I arrive at that future need, I am so thrilled with my own foresight: "Well done me from 10 days ago! Look at how well you planned ahead!" I pull one of the frozen soups, put in the fridge to unthaw for a couple days and we have a wonderful weeknight meal. 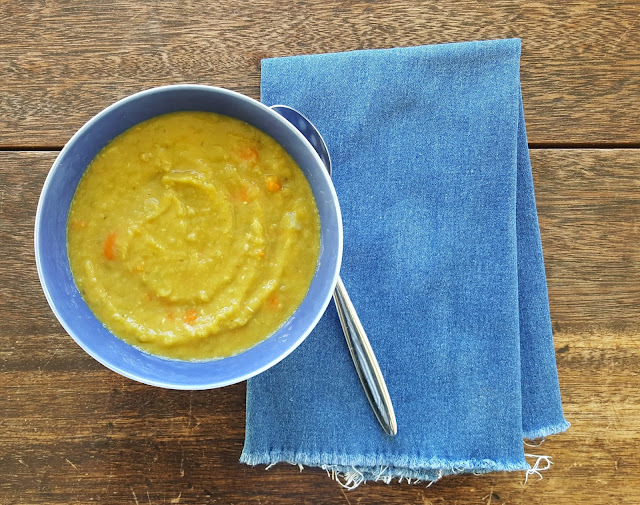 Split pea soup has been a favorite since I was a kid and my Dad used to put a batch in the crockpot, to cook all day with a ham hock. It was a comfort to walk in the door, from out of a cold snowy day, and have a bowl of it. While some soup recipes requiring doubling so that there is enough for leftovers, this recipe makes a whopping large batch of soup. I'd be impressed if someone had a soup pot large enough for doubling it. But what I really love about this recipe is the addition of dried oregano. In a million years I would not have thought to include it but Ina Garten, as she does so well, knows that the subtle herb note provides the perfect lift to the split peas. The only slight change I have made to the recipe is to add all the split peas at once and to cook until they are soft. Ina's original instructions have to cook 1 1/2 pounds of the split peas and then halfway through the cooking time, add the remaining half pound. The idea is that this adds a little bit of texture to the soup but I've found that I prefer the split peas cooked all the way through and smooth. 1) In a large stockpot over medium heat, add the olive oil and, once heated, add the onions, oregano, salt and pepper. Do not let the onions brown, but cook until they are translucent, about 10 to 15 minutes. Then add the garlic and saute for about a minute. 2) Add the carrots, potatoes, split peas and stock and water. Bring to a boil and then reduce heat so that the soup simmers. Split peas take a good long time to soften up. I find I need to cook for about an hour. While the soup cooks, a bit of foam with form at the surface. Take a spoon to skim off and discard. Give the whole mixture a good stir, every once in a while and take care that the bottom of the soup is not getting burned. 3) Before serving, taste for salt and pepper. It is at this point that I divide the soup and serve half and freeze the remaining portion. 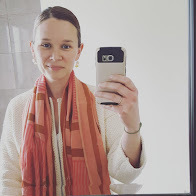 I found you blog through looking at elizabeth suzann clothes on instagram. you have great style.. would love to see more outfit photos! I grew up in AK and then lived in Southern CA for 19 years. My husband and I recently moved to a town in Central Washington. This is a place to celebrate the simple loveliness of every day things; scarves and stripes included.